It is only day 3 of Le Tour and Southern hemisphere cycling induced insomnia has already set in. It is probably not aided by the face that I am trying to get my riding in on the trainer in front of the television set as well. When is that first rest day? Anyways, a nervous peloton took to the hills of Corsica for the last day of racing on the crazy island. The stage from Ajaccio to Calvi certainly was bumpy, and there was not a straight section of road on the entire route. This further reinforces my opinion that Corsica is a crazy beautiful place that will have to be added This turned into a more traditional Tour stage where a small group of riders in a break would go out for an extended period of time before eventually being hunted down by the peloton. Lieuwe Westra of Vacansoleil was the main instigator for the break dragging with him Simon Clarke from the newly renamed Orica GreenWedge team along with Cyril “Jean-Paul” Gautier (Europcar), Sébastien Minard (Ag2r-La Mondiale), and Alexis Vuillermoz (Sojasun). Clarke had eyes on only one prize – taking the climber’s jersey from Pierre Rolland. On a side note, Pierre Rolland has fallen significantly afoul of the Velominati rules, particularly Rule #15 – Black shorts should also be worn with leader’s jerseys: Black shorts, or at least standard team-kit shorts, must be worn with Championship jerseys and race leadership jerseys. Don’t over-match your kit, or accept that you will look like a douche. Rolland you look like a douche, in fact he just looks like Mr. Dot. Having said that, I quite often on occasion break rule #17 as I do like my Garmin team kit – hey it’s good kit. So Clarke chased the points in the climbs, though challenged by a couple of the guys in the breakaway. Secretly I think that Orica GreenWedge have eyes on the polka dot as Clarke has previously won the climber’s jersey at the Vuelta. The break away group held out for over 120km before it started falling apart, leaving only Clarke out there to chase the final climb’s (the Col de San Bastiano) worth of points. But Rolland, from this year’s showboating Europcar team, would not be denied – jumping out of the peloton to leap frog Clarke and take the final points and keep the polka dots. He then displayed his affinity for a bit of downhill bombing and put on a real show. I think he was trying to go for the win. Neither rider raised their arms from the drops, and everyone thought that Sagan had pipped Gerro at the post but that wasn’t to be. Simon Gerrans was the winner by a wheel rim and I could hear everybody awake at 1am in Sydney on a Tuesday morning rejoicing at the top of their voices. Well at least I did. The GC boys kept their noses clean with Sky, BMC, and Saxo-Tinkoff all keeping their riders at the front of the pack and out of the banana peels that have so far plagued the peloton. Jans Bakelants kept the Maillot Jaune, with the Jensie pulling the peloton for pretty much the entire stage – impressive. Gilbert (BMC) came up short again, with the curse of the rainbow inflicting its charms. Sky have a major chink in their armour with Gerraint Thomas suffering major battle damage and requiring the application of the “magic” spray while in the saddle. This does not bode well for him tomorrow in the Team TT. Tony Martin still looks like a riding Egyptian mummy. The final highlight for me was Liggett pulling out one of his most famous lines for the first time this year – they were “dancing on the pedals” on stage 3. 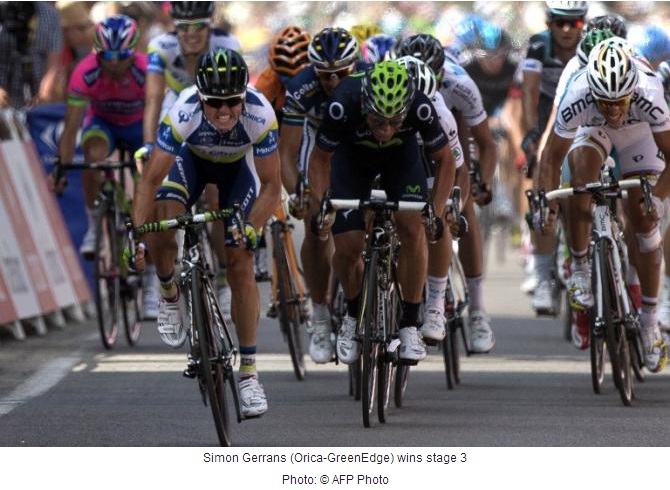 The lowlight (other than Rolland’s fashion faux pas and Clarke falling short) was Tomalaris having a significant case of foot in mouth in his exuberance for Orica GreenWedge’s first TdF stage win – what was he saying? Three stages down, 20 to go. It was some light riding to turn over the pedals last night, but I was on the torture machine for over an hour. Even though I backed it off last night, I can’t keep myself from accelerating as peloton reaches the finish line. My legs are a bit tender, but there is no time to focus on that – next is Stage 4 back on the mainland at the French Riviera around Nice. Bring it on! P.S. I think my wife wants July to hurry up already. I’ve got my TdF bingo card marked… Dancing on the pedals? Reminds me of the women’s gymnastics commentators. I think if you listen closely you can hear Bobke slap his ample forehead right after. It’s one of those, “I’m the awesomest commentator EVAH”!!! lines, while everyone around him is cringing. There hasn’t been enough dancing on the pedals calls just yet and I am looking forward to ticking off the bingo card. Can’t wait to see what Paul Sherwen pulls out of his a#$3. Good Tour so far. Indeed, much more enjoyable than the last couple of years… Oh, and Peter Sagan is an animal on a great team. Sagan is the new Cannibal. Awesome close finish to this stage! Well told. It was a great stage. Hope there is more to come. Its all a bit of fun writing up your own commentary when you don’t have an editor over the top of you. Great recap–I missed the stage and am actually pulling for Sagan since I have him on my Fantasy Tour team!